An essential boot you’ll love to wear all season. Crafted in waterproof leather and waterproof suede options, this iconic hiker boot features seam-sealed construction to help keep your feet dry in cold, wet weather. 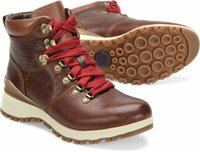 Its lightweight, flexible silhouette makes it ideal for everyday wear, and the high-traction rubber lugged outsole will keep you surefooted during walks in the snow. Extra set of matching brown laces included! I got these in whiskey and I'm soooo in love! Very comfortable and I love the heavy duty red laces! I want the black ones too (or the Diablo – I can't decide)!